Obvi­ous­ly my work has meant that I come in con­tact with a lot of users’ meth­ods that they share on the forums, and I’ve bor­rowed a few. The first method I ever imple­ment­ed was Doug Ireton’s “clas­sic” post on the RTM blog on imple­ment­ing GTD. My set­up devi­ates from that though. The basics are there — I try to min­i­mize use of due dates, I orga­nize my tasks by phys­i­cal con­text (home, phone, com­put­er, work, etc.) and I try to make my list cap­ture every­thing. How­ev­er, I try to keep my set­up as min­i­mal as pos­si­ble, a lot more min­i­mal than a full-on GTD set­up. The biggest thing is that I don’t real­ly orga­nize my tasks in projects; that’s just not how my work or life revolve. The rest of my orga­ni­za­tion is tag-based, and I’ve cre­at­ed a num­ber of Smart Lists (shown in blue) to orga­nize them in ways that I reg­u­lar­ly use. I use my Inbox as a place where my quick­ly added tasks end up — some­thing I’ll email in, a hand­ful of tasks I think of and want to get in quick­ly with­out set­ting any prop­er­ties, etc. — but I emp­ty it reg­u­lar­ly. This is a list of all “next actions”, things I can do present­ly. Nat­u­ral­ly, this will exclude any­thing I’ve “put to sleep” as men­tioned above, and also things that I’ve des­ig­nat­ed as some­thing that I’ll get to lat­er. It also catch­es any­thing I haven’t filed cor­rect­ly (any­thing not tagged cor­rect­ly or in my Inbox) and it will exclude any­thing in my spe­cial Tar­get and gro­cery lists. This is a Smart List that shows me the things I real­ly have to do today — or should at least try to. On a real­ly good day, I’ll clear this list. It’s every­thing from the !Next list that’s over­due, due today, or high pri­or­i­ty. Per­haps its obvi­ous, but this is where I spend the bulk of my time, with the occa­sion­al jaunt over to my !Next list. 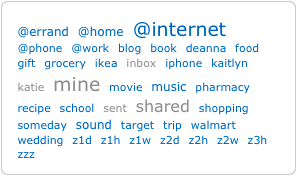 Last­ly, my Tag Cloud shows how my tags/lists are being used. It should be no sur­prise that a lot of my tasks are things for me to do on the inter­net. My goal with my orga­ni­za­tion is to make it quick and easy to use. I can quick­ly add a task that will show up where I’ll see it (!Next and !Today) and orga­nize all sorts of tasks that won’t show up there. Let me know if you’d like any more point­ers or tips on how I do things. I start­ed this post on Decem­ber 15, 2008. I’ve most­ly kept it intact and sim­ply pub­lished it for the sake of get­ting it out there. It’s not near­ly as sprawl­ing as I ini­tial­ly intend­ed; you’re wel­come. Remem­ber the Milk is one of my favorite web­sites.1 Keep­ing a list of tasks, keep­ing it sim­ple, and keep­ing it cur­rent are ways I man­age my life. It’s noth­ing super pro­found or super impor­tant for me, but a list of tasks keeps me from becom­ing over­whelmed. Basi­cal­ly, you make your stuff into real, action­able items or things you can just get rid of. Every­thing you keep has a clear rea­son for being in your life at any giv­en moment — both now and well into the future. This gives you an amaz­ing kind of con­fi­dence that a) noth­ing gets lost and b) you always under­stand what’s on or off your plate. Tid­dlyspot: A host that offers free Tid­dly­wikis, Tid­dlyspot show­cas­es a few “fla­vors”, two of which are geared to GTD usage. Quite use­ful, easy to get used to, but only real­ly usable on the inter­net and from a com­put­er. And way too fid­dly for my taste. Remem­ber The Milk: It shouldn’t sur­prise you at this point that I use Remem­ber The Milk2, but I’ve been using them for two years. RTM’s ser­vices are its strength; you can access your tasks wher­ev­er you are — on your com­put­er, phone, in your Gmail, etc. — and be remind­ed of what you have to do. Sor­ry this post doesn’t have a great fin­ish; like I said, I’m pret­ty much pub­lish­ing it as-is, and I don’t have any­thing pro­found to say at the end of this. Let me know if you’d like my thoughts on some­thing else.